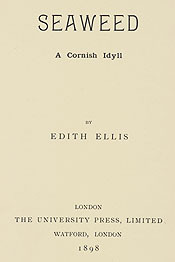 Edith Ellis was the wife of Havelock Ellis, the writer of books on sexual science. In Seaweed, the deeply sensual heroine is married to a pious but paralyzed miner. At her husbands insistence, she conceives and successfully produces a child with another man. Edith Ellis. Seaweed. A Cornish Idyll. London: University Press, Ltd., 1898.